TELPRO Mesh Anodes are manufactured using a titanium expanded mesh substrate, which meets ASTM B265 Grade 1 or Grade 2, which has been coated with TELPRO Mixed Metal Oxide coating. TELPRO MMO coating consists of IrO2/Ta2O5 and is suitable for use in all cathodic protection applications. Because mixed metal oxide anodes have an extremely low consumption rate, the titanium substrate remains constant throughout the design life of the anode. TELPRO’s Canistered Mesh Anodes have been designed specifically to replace the massive 3” x 60” silicon iron anodes, typically used in horizontal and shallow ground beds. 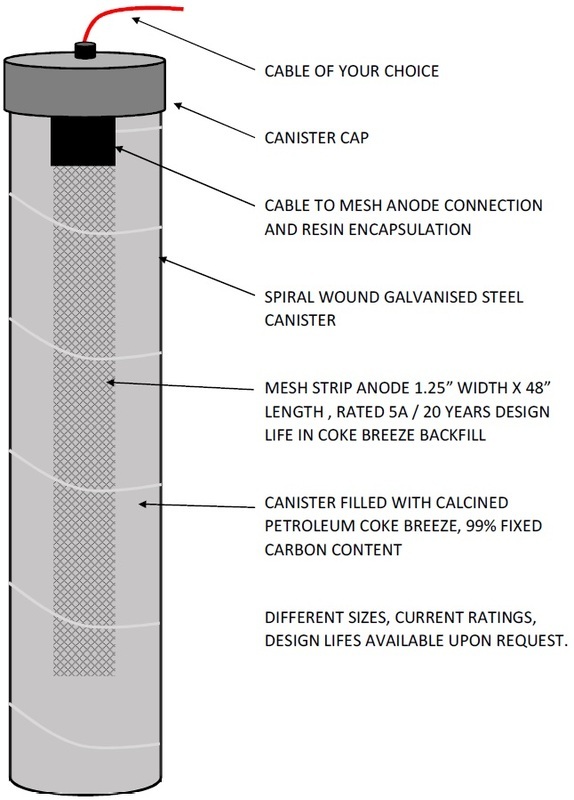 The TELPRO Mesh Strip Anode is 1.25” wide by 48” long and is rated at 5 amps, for a 20 year design life, in fine petroleum coke. TELPRO Mesh Strip Anodes can be packaged in galvanized steel canisters or flexible fabric sleeves, both of which are available in a wide variety of diameters and lengths.